So here's the deal. I need your help. ...and let's just say they were a pretty good deal. Mainly because the bases were tarnished. Like eating through the metal tarnished. But, still they are a really good size, and the shape was super cool. So, I bit. Thinking, "well, I haaave some Brasso. I'll give that a try, and if it doesn't work, there's always paint. Right?" Now kids, you know I love a good patina. It gives character, and life to pieces. However, this might be too much. 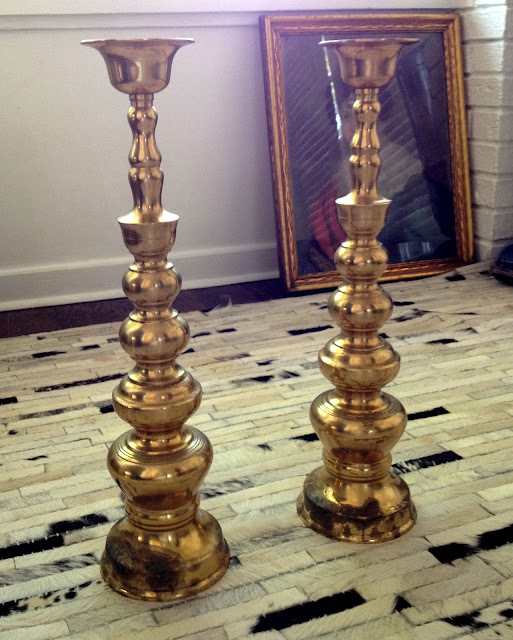 Specifically, because the rest of the candlesticks are in great shape. If they had the age all over them, I might not have as much of problem with them, OR I might not have purchased them at all. 1. Leave them as is. 2. Try and "age" them. Making the patina an all over look, instead of just the bases. 4. Or (and this is the least likely, as it could go "crafty" really fast.) do I just paint the bases the black and leave the rest brass. Now remember, these are going into the shop...for someone to buy (ideally.) 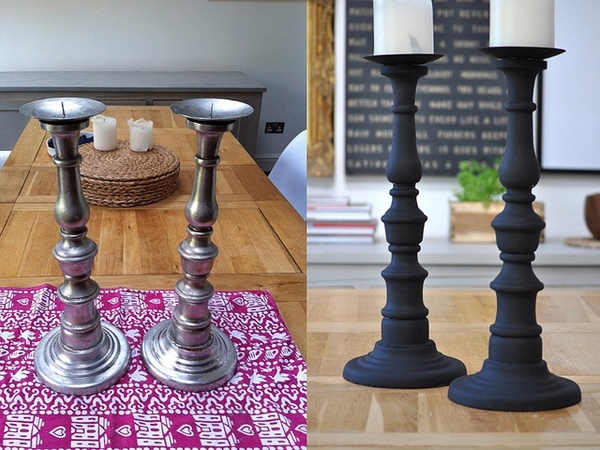 If you were in the market for fabulous, generously sized and shapely candlesticks. What would you most likely be drawn to, out of my options? OR do you have any other briiillllllliant ideas? Oh yeah, and happy almost weekend to ya! Why not try 0000 steel wool? It works miracles. Use it as if you would if they were wood -- go with the grain. You can by that in a bulk pkg at hardwares and home improvement stores. One thing for certain - it can't make it worse. 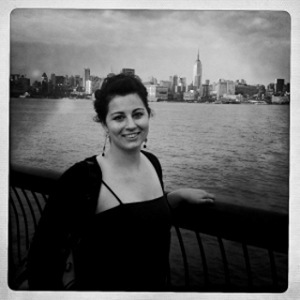 Was just reading Jannell's blog, Isabella & Max...How about some Rub 'N Buff? This idea is a little out there but you could instead of just painting the base black, use some painters tape to paint every other section black to give it a striped look. It might look absolutely ridiculous but it also might look really cool. Hope whatever you chose works because those are gorgeous! did you try any other methods for cleaning brass? I have had some success with a lemon half sprinkled with salt. That's too bad! Those are beauties. I think I would paint just the base or the base and the top "cup" where the candle goes with brass in between. Love them! What about sawing off the offending bit at an appropriate point? Maybe faux mercury glass? A light black under coat, glass-look spray paint with an acid treatment (vinegar and water works well), then a touch of gold paint rubbed in? Mmmmm... My dining room table is drooling. These are fab. I would paint just the base, but I would do it in a fun trendy color like a bright pink! Give them a fun spin on a contemporary object. I seriously can't wait for your shop! You find the most amazing things I can only imagine what's in store! I have one of those exact candlesticks at my house! Please don't paint them - have you tried Barkeeper's Friend? Most grocery stores carry it - look by the Comet. 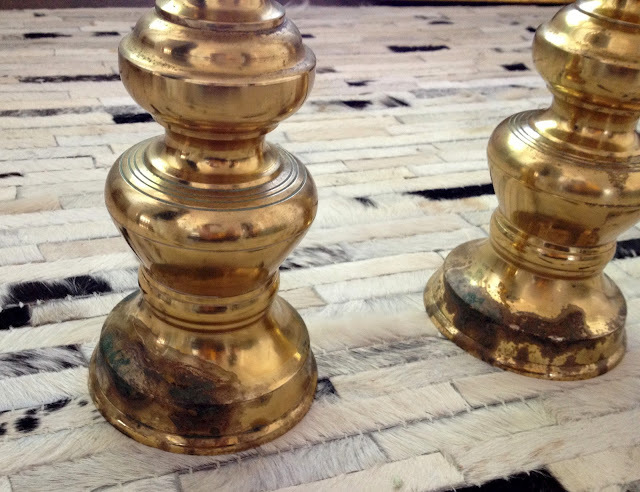 It gets out lots of nasty tarnish - and you'll want to follow it up with a good brass polish. Good luck! The base looks quite big so there would be room for words like "welcome, merry christmas, happy birthday" etc.